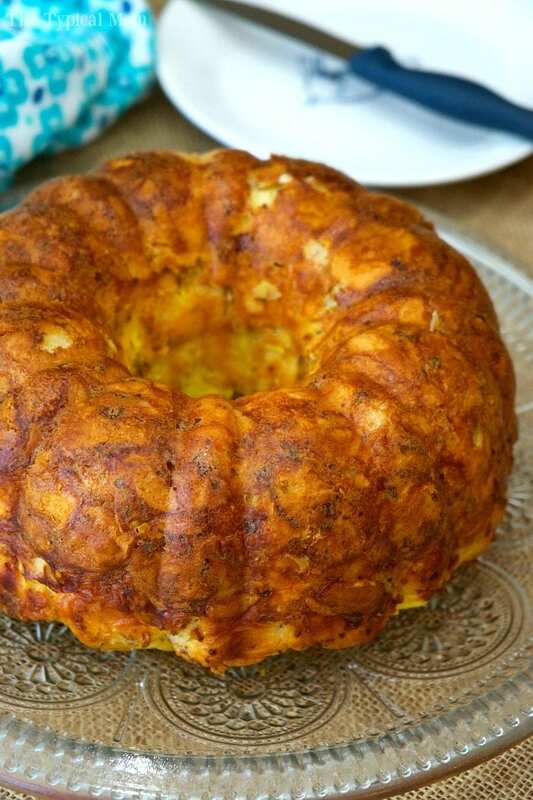 This bacon egg and cheese breakfast bundt cake tastes amazing and is so easy to make!! If you’ve never thought of making a bundt cake breakfast it is sure to be a hit during the holidays. A pretty way to present your favorite breakfast items and a great way to take breakfast on the go. Both ways look really nice. Do NOT overcook this breakfast bundt cake or it will dry out. The egg will continue to cook a bit in the pan so once it is lightly browned on the top take it out to cool. It’s best to add as many add ins as possible like diced ham, bacon, even diced bell peppers would be good. You can taste the crunch right?? Did you know you can make monkey bread right at home using cans of refrigerated biscuits??!! 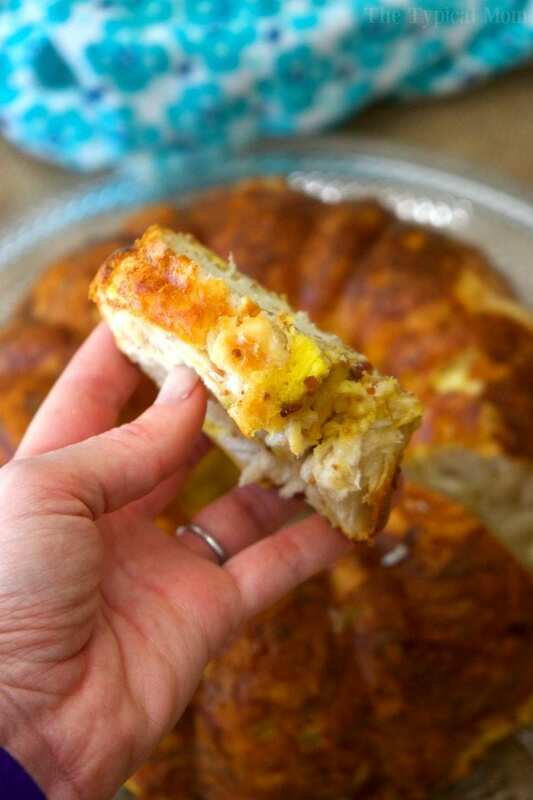 Whether you’re looking for a breakfast savory one like this, or a really sweet version like our pumpkin caramel monkey bread that is great for dessert. I know you’ll love both. 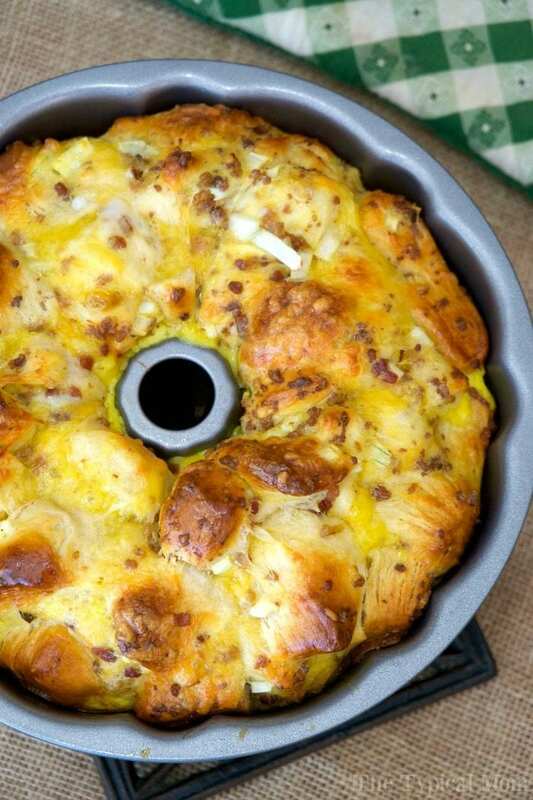 You can really add in a lot of spices and bits like scallions and onions or leave it quite plain and just add the egg, cheese and bacon…which are the highlights to this savory breakfast bundt cake. If you love this easy breakfast bundt cake you must try this easy gingerbread pumpkin bundt cake we’ve made too! Using a bundt pan is an easy way to really jazz up the way a recipe looks when it’s done. It’s simple, inexpensive, and makes an ordinary dish look pretty. Whether you make this for breakfast, as a side for brunch or try one of our sweeter versions for dessert it is one of our favorite treats! Let us know what you think when you make it. Here are a few more easy breakfast recipes you will love. Then when you’re done you should try our pressure cooker egg bites too for the ultimate morning! Our apple monkey bread recipe is fantastic if you’re having a brunch and want something sweet with fresh fruit in it. And air fryer bagels stuffed with cream cheese are great for breakfast too! Now if you have an Instant Pot you can make this pressure cooker breakfast bundt cake that tastes just like this one but in no time at all! Here’s the printable recipe for breakfast bundt cake to follow. 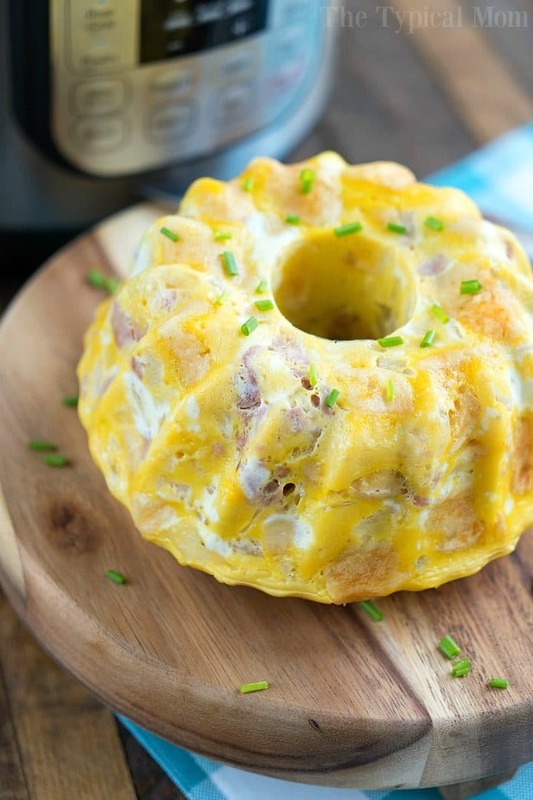 This bacon egg and cheese breakfast bundt cake tastes amazing and is so easy to make!! If you've never thought of making a bundt cake breakfast it is sure to be a hit during the holidays. A pretty way to present your favorite breakfast items and a great way to take breakfast on the go. Cut each biscuit to 6 pcs. and put in a bowl. Whisk eggs and add salt pepper, and any diced onions or scallions if you so desire, pour over biscuits. Cook your bacon, crumble, then add to bowl with biscuits. Shred your cheese and add to bowl. Use a spoon or hands to gently mix the biscuits and items in mixture keeping pcs. of biscuits in tact. Spray inside of bundt pan WELL with non stick spray. Pour mixture into your pan and spread around the pan evenly. Bake for approx. 40 minutes or until a beautiful brown color is on the top. Cool before serving. Loosen sides well before flipping over so it slides out. Let me know how those work out. Do you think this would work using thawed frozen yeast rolls dough? I’m not that crazy about canned biscuits. The recipe sounds delicious. I’m not sure, I haven’t tried that. Love how easy this comes together! A definite favorite! Oh my heavens! The whole family loved this! So delicious! Yum, this looks delicious. I can’t wait to make it! this is so genius! i love it, thank you! I make a version of this for years using cubed french bread. I slice it into wedges, freeze and put into lunch boxes for my family. It has been a big hit with my kids and now grandkids. Glad they love it too! Very good. I used 1 can of Grands, and 8 eggs. Perfect ratio of bread to eggs. This looks so yummy and fun! I can’t wait to try it! 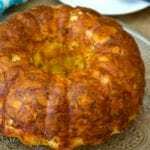 I have never thought to do a savory bundt cake for breakfast! What an awesome idea! What a great dish for a weekend or holiday brunch. Adding this to my list to try! I made this wonderful bread (sort of) the other day. My wife and I like sweet breakfast food so i used 6 home style bisqucits, 6 eggs, half a container of marcarpone, 1/2 cup of crasins, a small can of mandarin oranges (about half of the can chopped), a 1/4 cup each of walnuts and pecans. Between 35 to 45 minutes. It came out warm and sweet, perfect with real butter. I put the leftovers in a air tight cake holderand placed in the fridge. Next morning i dipped each slice in a mixture of eggs and heavy cream, the french toast was the best i ever had. Hi. What size cans of Grands should I use? I have never seen any other sizes, Grands are the larger sizes of refrigerated biscuits. i dont know why i like food like this.. its like the food called me. your smart to make it..i want to be able to like you..
I’m coordinating food for 45 teenagers on a trip this summer and wondered if 4 or 5 of these can be baked ahead and frozen? How long would they take to thaw and could you reheat in a microwave without drying out? Did not like this recipe, if I ever did make it again I would use small biscuits. Using Grands biscuits over-powers the rest of the ingredients and all you have is biscuits in a bunch pan. I am with you. I used regular biscuits (10) count and it was too much bread. Next time I will only use 5 of the smaller biscuits and add a couple of more eggs as there was not enough egg in the mixture to suit me! do you think onion powder could be substituted for the onion. If my family sees onion in anything they won’t eat it. I used onion powder and it tasted good. The next time I make this I will only use 1/2 can of regular biscuits. One can is too much. I might even add a couple of more eggs. Are the biscuits a five count can or 10 count? This was a big hit when we had a recent family gathering. I’m going to try in loaf pans because it is excellent as leftovers and toasted so is harder to slice for toasting when using the bundt. I’m also going to try it sometime with nuts and cranberries instead of the bacon and onions. Thanks. I’m obsessed with my bundt cake pan too! This looks so yummy!! I can’t wait to try it. I want to prepare this tonight but bake in the morning. Its for a work breakfast. Do you know if it will be OK to leave mixture overnight? It sounds so easy but want to save some time in the morning. I just read someones comments. You haven’t tried it yet. Well I am going to try it and let you know. I think I will add an extra egg and maybe some milk. I put all the ingredients together the night before and baked in the morning. It was a bit dry. I even added an etra egg and some heavy cream I had on hand. Tasted good but just a bit dry. I don’t recommend making it the night before and baking in the AM. It is very similar to my sausage/egg casserole and I always assemble it the night before. The egg mixture soaks into the bread or biscuits. I also use more eggs.You can’t do anything wrong unless you burn it!! Yummy. This looked like an amazing recipe to use for brunch guests, so I made it yesterday with some adjustments. I added crumbled sausage, broccoli, onion, mushroom, roasted red pepper and cheese. I increased the number of eggs to 10. I had to cook it longer, and raised the temp to 375 degrees for the last 15 minutes (I covered the top so it wouldn’t over brown) but it came out perfect. As you mentioned in one of the posts, it’s is a little ‘bready”, so I may adjust things again and reduce the biscuits and number of eggs. I sliced it and put it in the toaster, and dipped slices in egg and milk and French toasted them, drizzled maple syrup over YUM! Maybe a less bready version would not be as versatile. Super concept with lots of room for creativity. Thank you. Could this be made ahead of time to be baked later, perhaps the night before? I would probably be okay, I haven’t tried that. Made this today and was delicious. The next time I make I will add a little green onion. I was also thinking with the leftovers, to maybe french toast it. I don’t normally comment on things like this but we found this to be really dry (biscuit to egg ratio just isn’t right). If you prefer less bready you can use regular instead of Grands biscuits. It’s stated 10 servings, but what is the serving size so it can be compared to the nutrition table? I haven’t no, you’d need to cut up into bite size pcs. so don’t think so. I would love to make this but I’m only one person. How long will it keep in the refrigerator or can you freeze it? Hmmmm, well you could half the recipe if you wanted and then put in fridge to re warm the next days. Just cut the time and watch because it won’t be as thick. Just halve the recipe and bake it in a loaf pan instead of a bundt pan. Yiu have how many calories per serving but I didnt see # of servings. The carb count is listed as 3. Are you sure this is correct? Seems low. Thanks! Just fixed…didn’t calculate right the first time. It is calculated by the recipe widget so cannot guarantee accuracy myself though. Could you add more eggs say 3 more eggs to add more protein ? How long would you bake it if using a 9×12 pan? Maybe check after 30 minutes? When you say to scramble the eggs, do you mean to make scrambled eggs in a pan or beat the eggs a bit and pour them over the biscuits raw? Sorry, whisk may be a better word. I changed it. No do not precook eggs. Watch video for instructions too. Can we use normal bread. Can you tell me what are refrigerated biscuits , we might call them something else ? ?